If you have questions please feel free to email us. Going green and ultimately saying good bye to all one use plastics is the best thing we can do for the ocean. Show off your support for the ocean in our new favorite top! Wilddtail does not offer refunds and has an Exchange Only Policy. Since we do not mass produce our pieces, we do not accept returns at this time. 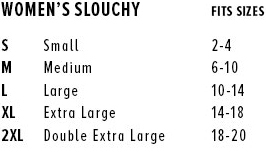 We encourage you to view our Size Chart and given measurements to ensure proper sizing. Wilddtail does not offer physical exchanges of goods, instead you will be issued a Store Credit that can be seamlessly applied to your preferred new item. Please understand that Sale Items as well as Custom Orders may not be Returned or Exchanged and are Final Sale. For all exchanges within the U.S., items must be returned within 14 business days from the date of receiving the item. All international exchange requests must be submitted within 21 days from the original shipping date. Exchange requests outside of this grace period will not be accepted. Once your return has been accepted, you will be notified via email of your Store Credit then can then be applied to your next order. Please email us if you have any further questions! Wilddtail does not cover return postage costs. The return cost shall be incurred at your own expense. To ensure any loss or damage, please ensure your return package is both prepaid and or insured. Wilddtail reserves the right to refuse returned goods that have been previously worn or washed. ..==When you place an order, we will estimate shipping and delivery dates for you based on the availability of your items and the shipping options you choose. Depending on the shipping provider you choose, shipping date estimates may appear on the shipping quotes page. © 2018 WILDDTAIL INC. ALL RIGHTS RESERVED.